There are growing pressures for businesses to explain how their activities impact the environment and society at large. In Europe, and indeed in many if not most other regions, small and medium-sized enterprises (SMEs) account for the majority of private sector GDP, employment, and environmental and social impact. It is perhaps no surprise then that some wonder whether SMEs should disclose such impacts. The need to better understand this issue, EFAA has conducted research on Non-Financial Reporting Requirements for SMEs in Europe, which looks at the nature and extent of non-financial information (NFI) reporting by SMEs in 14 European countries. European Union (EU) Directives require reporting by companies beyond the financial statements. Most EU member states covered by EFAA’s survey have not extended these rules in content and have taken up the options to reduce the reporting requirements on SMEs. For example, 13 of the 14 countries do not require micro companies to prepare or publish management reports and all 14 exempt medium sized companies from including non-financial performance information in the management report. While the Non-Financial Reporting Directive (NFRD) only applies to larger companies, EFAA’s survey suggests that NFI reporting is quite common for SMEs due to national reporting requirements. For example, 6 countries require other content to be included in the management report for medium or small companies and 7 countries routinely require other reports to be prepared for their governments or for publication. These ‘national extras’ have resulted in diversity and, perhaps, lack of harmonization of NFI by SMEs across countries. The survey’s findings may have implications for regulators and policy makers seeking both to ensure harmonization in the shape and form of SME reporting and to enhance the transparency of societal and environmental impact of companies across the EU. While extra national requirements for disclosure in the management report, such as corporate governance, may not represent an administrative burden for SMEs, extra national requirements in the shape of other reports, such as on modern slavery, sometimes do represent a material burden. If the EU wants corporate reporting to be a vehicle for gathering information and raising awareness of environmental and societal concerns, then including new disclosure requirements for the management report in the Accounting Directive is likely an effective way of doing so. There is increasing emphasis on pursuit of the Sustainable Development Goals (SDGs) and the corresponding need to measure economic, social and environmental performance. According to its proponents, the reporting of NFI can help SMEs access finance, secure new business partners, attract new consumers and clients, and attract and retain talent. SMEs that do not produce NFR may miss out on these benefits. Some elements of the NFRD might be suitable for voluntary adoption by SMEs. At a 2018 roundtable event on the ‘Reporting of NFI by SMEs’, we gained additional insight from a variety of senior panelists. Representatives from GRI and the IIRC stressed the relevance of their reporting frameworks to SMEs, the scalability of their frameworks, and the efforts they had taken to promote their frameworks to SMEs. For example, GRI has published Small-Business, Big Impact – Making the Case for SME Sustainability Reporting and the IIRC is developing implementation guidelines on integrated reporting for SMEs and also recently published a publication with IFAC – Creating Value for SMEs through Integrated Thinking. Furthermore, EFAA has published the paper ‘Integrated Thinking and Reporting for SMEs: The Why and How’ on the issue. 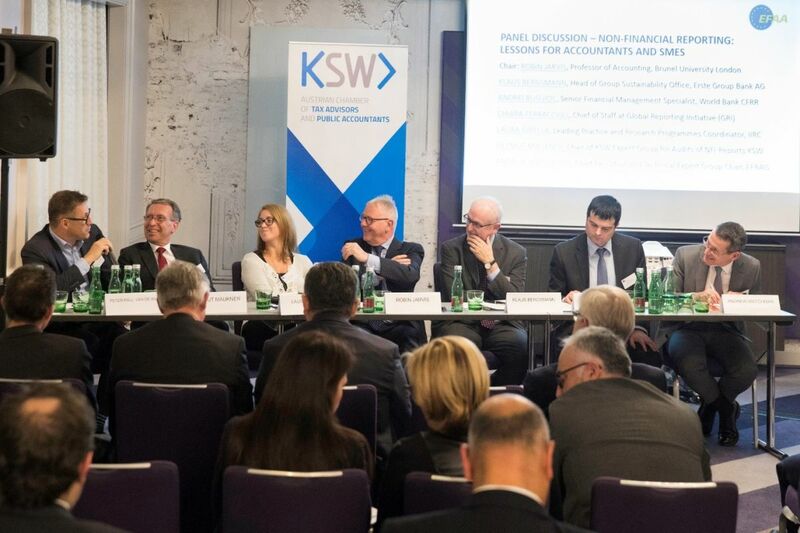 Helmut Maukner, Chair of KSW Expert Group for Audits of NFI-Reports, noted that many SMEs have to comply with NFRD by virtue of being subsidiaries of or suppliers to larger companies and stressed the role accounting firms can play in helping clients report NFI. Klaus Bergsmann, Head of Group Sustainability Office, Erste Group Bank AG, said that while banks tend not to require NFI from prospective borrowers, such information is still welcome. Overall, there was general support for the implications and policy considerations set out above, and indeed some suggested the latter might be stronger. Nevertheless, there was consensus that NFI by SMEs ought to be a voluntary endeavor with, perhaps, some outline guidance to drive a degree of transparency and comparability across the EU. In this FT article Mervyn King argues integrated reporting is key to sustainable finance while another FT article sees SMEs as the key to meeting green targets. With NFI now front-of-mind for international standard setters and regulators, we invite you to join us for a follow-up event on 19 February 2019 at the Press Club Brussels Europe. The event will feature a panel discussion with MEP Wolf Klinz (ALDE) and MEP Philippe Lamberts (Group of the Greens), as well as representatives of SMEs and the accountancy profession. To register please click here. As the IIRC publishes answers to the most frequently asked questions on integrated reporting, its CEO, Richard Howitt, discusses why the time is right to adopt integrated reporting. ICAEW synthesizes a holistic review of the processes of digitalization, taking into account the needs of various stakeholders, whether they be taxpayers individual or corporate, the government, tax professionals, or even software vendors. Accruals-based accounting and auditable financial statements linked to comprehensive budgeting are a key part of improving public financial management worldwide.